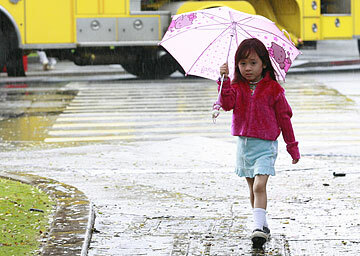 Meisha Diwa, 4, toted her Hello Kitty umbrella down Kapiolani Boulevard yesterday. Steady rains pummeled the islands yesterday, as expected, but meteorologists are beginning to see a bit of sun in the not-so-distant future. Until then, more wet stuff is predicted through the weekend, and a flash flood watch was expected to continue for all islands through tonight. The weekend is expected to start off with partly cloudy weather and a chance of thunderstorms tomorrow, due to a low-pressure system still to the west of the islands. But a transition is expected to happen Sunday to Monday, when the tradewinds begin to return, said National Weather Service meteorologist Vladimir Ryshko. He predicted "showery, not so much widespread, heavy rain." Except for the Big Island, the main Hawaiian islands will be mostly cloudy today, with showers and a chance of thunderstorms. Yesterday's steady, sometimes hard-driving rains created problems throughout Oahu. A small landslide occurred near Burger King off Kamehameha Highway in Kaneohe, a Fire Department spokesman said. And water got up to 3 feet deep in Mapunapuna, where Oahu Civil Defense reported flooding. The National Weather Service also reported large puddles of water on Ala Moana Boulevard near CompUSA and on Nimitz Highway in Iwilei. Localized flooding included a building at 530 Halekauwila St. in downtown Honolulu, and manhole covers that popped off at Richards and King streets and Punchbowl and South Beretania streets. But the Honolulu Fire Department was not besieged by calls, perhaps because some residents were taking care of problems on their own, one fire captain speculated. On Maui, heavy rains forced the county to close its container recycling redemption center in Lahaina because of flood damage. The county also closed Baldwin Beach Park and declined to issue permits to campers at Kanaha Beach Park in Central Maui.